The M&S checkout process is pretty smooth, and features many best practice recommendations: there are few steps to get from A to B and there’s a useful bar that indicates progress through the checkout. All good. However, M&S has failed to enclose the checkout, so customers can easily – or accidentally – click the logo to go back to the homepage and leave the process. Enclosing the checkout means removing all links to any parts of the site other than the other stages of the process, to focus the customer’s mind. Once in the checkout there should be only one place customers can go – purchase confirmation. The link to the basket is prominent enough, and consistently in the same place across the site, which is what users would expect. However, there is no clear link to the checkout. Most customers will realise that clicking on the basket link will take them to the checkout, but others may not be so sure, sowhy risk losing out on sales for the sake of adding a checkout link? User reviews are something that web shoppers are increasingly coming to expect, as they offer valuable help in making a purchase decision and can increase conversion rates for etailers. M&S, like some other major retailers such as Tesco, has yet to take advantage of user reviews, but they would be wise to add this feature. Surely it’s only a matter of time? It is in a great position to harvest customer evangelists. 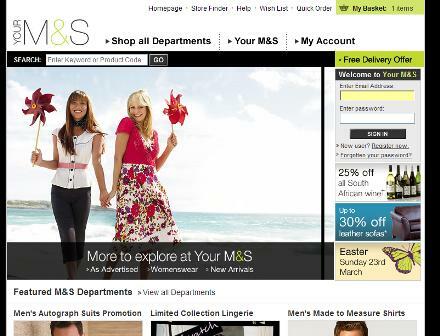 M&S has a large product range, and this can mean some lengthy URLs that have no connection to the product displayed on the webpage. Adding related keywords to product page URLs can help SEO, as well as making them more understandable (and guessable) to the site’s users. These are among the most important factors in a consumer’s purchase decision, so customers shouldn’t have to search around for this information. M&S does not currently display any kitemarks or third party verification logos, to convey trust and respectability. These logos can ease the mind of the prospective buyer. These should ideally be displayed during the checkout process, but M&S does not do this. It is a very well-known brand, so this may not deter many people from buying, but less well known e-commerce sites should seek to reinforce customer trust. If a customer wants to get in touch about something, why make them hunt around for a contact number? They may be on the verge of making a purchase, but need to ask a question, so don’t frustrate them. M&S does have a range of contact options on the site, but they are at the bottom of each page. Why not provide a visible contact number on the product pages? Before you can make a purchase on the site, M&S requires you to register by adding your address details, email address as well as choosing a password. This is placing unnecessary obstacles in front of prospective customers, who will have to enter their address details for delivery anyway. It makes no sense to do it this way around. Far better to give them the option of heading straight for the purchase without registering first. M&S is currently running a promotion offering free delivery for any orders over £30. This is an excellent idea, as free delivery can help drive sales, but M&S has made this offer too complicated. Customers wishing to take advantage of this offer need to enter the code ‘FREEDELV’ at the checkout, while items like furniture, appliances and wine are excluded from the offer. This, in a nut, is RIDICULOUS. Why would you make a relatively simple offer – which customers can easily understand – into a complicated process. Why not just offer free delivery on ALL orders over a specified amount? Get email marketing right and it can deliver huge revenues for a very low cost. Get it wrong and you are simply wasting your time, annoying your customers and damaging your brand. Here are 3 practical tips.